What can the call to discipleship, the adherence to the word of Jesus, mean today to the businessman, the soldier, the laborer, or the government worker? What did Jesus mean to say to us? What is his will for us today? Drawing on the Sermon on the Mount, Dietrich Bonhoeffer answers these timeless questions by providing a seminal reading of the dichotomy between "cheap grace" and "costly grace." "Cheap grace," Bonhoeffer wrote, "is the grace we bestow on ourselves...grace without discipleship....Costly grace is the gospel which must be sought again and again, the girl which must be asked for, the door at which a man must know....It is costly because it costs a man his life, and it is grace because it gives a man the only true life." Life Among the Flossenberg martyrs was a remarkable young Lutheran pastor named Dietrich Bonhoeffer, who had joined the underground convinced that it was his duty as a Christian to work for Hitler's defeat. Bonhoeffer was only thirty-nine when he died, but he had already made a monumental contribution to Christian thought, which today has profound and growing significance for both theologian and layman. 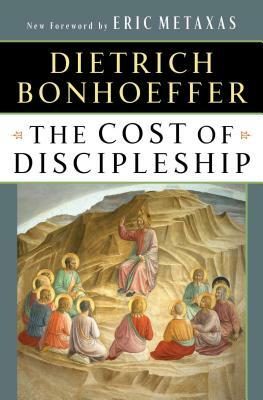 Bonhoeffer's books are gaining an astonishing popularity in the secutar world....He is admired by people who have read his best-known books, The Cost of Discipleship and Letters and Papers from Prison, as the example of what a modem Christian must be. Times Literary Supplement (London) A very moving book, lived as well as written.